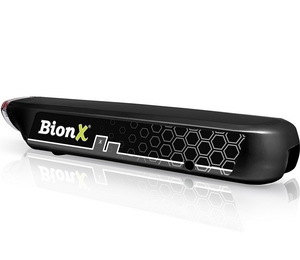 BionX X-size batteries give you the freedom of up to 105 km (65 mi.) of assisted riding, and the portable, compact power supply is great for quick recharges on the go. All BionX batteries are lightweight and can be installed and removed in a matter of seconds, so you can recharge inside at night, or in the office in the middle of the day. All BionX 48V batteries are now equipped with a “Deep Sleep” function, which acts as a method of energy preservation. Depending on the battery state of charge, as well as inactivity the battery automatically puts itself into “Deep Sleep” mode – resulting in no energy consumption during stand by. This enables shelf life of up to 18 months for a fully charged battery. To activate the battery from “Deep Sleep” simply connect the battery to the 26V BionX power supply. IMPORTANT: All current 48V BionX batteries are set for RC3 communication protocol. If you have a G2 or G1 console then the battery has to be set for the G2/G1 protocol. Please select the appropriate protocol below.